The "Bundle of Joy" Package is for you new or soon-to-be new mommas out there looking to secure a sweet deal to capture the major milestones of your little sweetheart's first year! 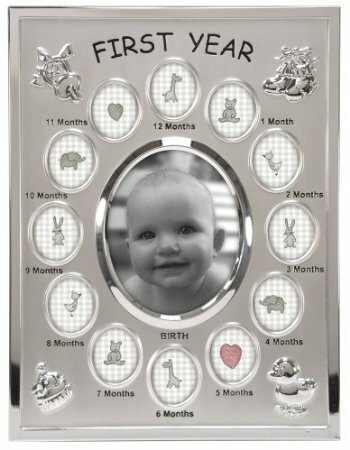 "First Year" Photo Frame -- Styles may vary. To book this special package, contact us via e-mail at ash@mommyknowsbestphotography.com or call (815) 600-9626. In order to lock in your rate, we ask that each client participating in the Bundle of Joy promotion sign a contract. Early termination of your contract will result in a $100 cancellation fee. All session appointments must be booked at least 48 hours in advance. Fees are non-refundable but are transferable with 24-hour cancellation notice or should your child be having an "off" day, Mommy Knows Best Photography reserves the right to reschedule your session at no additional cost to you. Should you need to reschedule, please provide a 24-hour notice. Your session begins promptly at the scheduled time. All portrait sessions in your home may only occur if a minimum of 10'x10' space with access to an electrical outlet is available. Please provide an accurate description of the proximity of the outlet so that we may bring the appropriate length extension cord. Any sessions beyond 20 miles of zip code 60447 will incur a $25 travel fee. Offer not valid with any other promotion or offer.